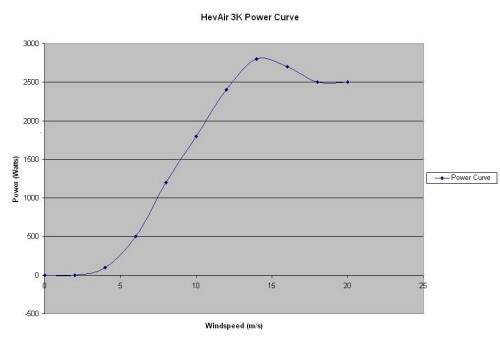 The HevAir 3k is a domestic scale wind turbine suitable for use in homes, farms and light manufacturing applications. It was designed and is manufactured in our manufacturing facility in Crossmolina, Co. Mayo and will handle and survive in the Class 1 wind region that is the West of Ireland. The HevAir 3k wind turbine can help in reducing your dependency on fossil fuels and with the ever increasing costs associated with buying energy. This neat and rugged wind turbine will quietly and efficiently pump out the power whenever the wind is blowing. Its simple yet sturdy design will insure that throughout its lifetime this wind turbine will perform reliably and give trouble free operation. 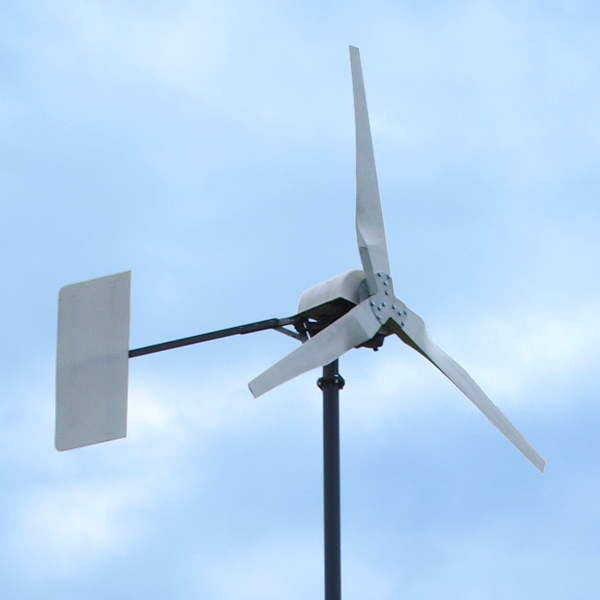 Install this wind turbine and let it do its work without having to worry about it. The wind turbine employs passive yaw control to protect itself from overspeed conditions. This passive yaw control allows the wind turbine to create an angle between the blade rotor plane and the oncoming wind direction. Introducing this angle has the effect of reducing the amount of wind power that the blades can capture; thereby protecting the wind turbine from exceeding its rated RPM. This type of control is known as furling. The wind turbine faces itself into the direction of the oncoming wind in normal operation. When the windspeed increases past the rated windspeed the turbine begins to create the angle, this angle becomes greater as the windspeed continues to increase until the angle reaches nearly 90° at which stage the amount of wind power the turbine can capture has been minimised to its rated power. In a situation where the windspeed is expected to be very high (i.e. a storm) the furling mechanism can be operated manually from the base of the tower so that the angle can be maintained at 90° for the duration of the storm. This introduces an extra safety feature that allows the turbine to protect itself from the destructive winds of a storm. To compare the way the passive yaw control works to a more common situation imagine standing at the side of a lake and dropping a flat stone vertically. The stone will hit the water and sink. Now imagine throwing that stone at an angle close to horizontal out into the lake. The stone will impact the water and then bounce off the water and continue on. (In Ireland this is called skimming). In the situation where the stone is dropped vertically all of the energy the stone had is transfered into the water. When the stone was thrown at an angle only some of the energy the stone had is transfered to the water while the rest is used to allow the stone bounce off the water and continue travelling.